'The Chimneys', the Charles Porter Wilson estate designed by Charles Hart of Hart & Shape c. 1928 in Mill Neck. Wilson was the chairman of the western division of the Great Atlantic and Pacific Tea Co., better known as A&P. 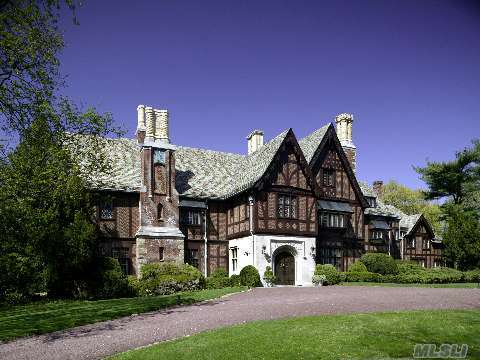 He died in 1929 and the house is usually referred to as the Mrs. C. Porter Wilson estate. 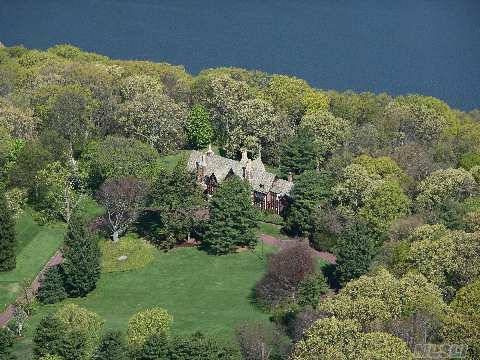 The house along with 24 acres, 900 feet of waterfront and a number of outbuildings is for sale for $20,000,000, click HERE to see the listing on Daniel Gale Sotheby's. Click HERE to see 'The Chimneys' on google earth. Listing photos from Daniel Gale Sotheby's. One of the truly great intact properties. 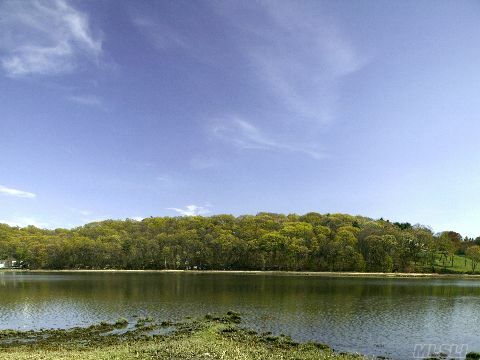 Perfect size, excellent condition, intact details,lovely water views, beautiful road and virtually no traffic noise. This is right up there with Oak Knoll as a great estate that was scaled just right for today. very quiet.very private. Mill Neck, exclusif. One of my favorite towns, too. The Chimneys shown here is on Horse Shoe Road on the north end of the peninsula. Arguably one of the few properties on the market worth its asking price, especially when one considers the acreage & how well-preserved it is. Security word - obidwin: the process of acquiring something from eBay. I hope whom-ever is fortunate enough to purchase this masterpiece keeps it the way it should. Zach, there was also a listing for a 1929 fieldstone manor on 32 acres for 12,9000,000 in Brookville; listed on Daniel Gale and on Prudential Douglas Elliman. I no longer see the listing.Do you know if this estate has been sold? And if so, to a developer who will sub-divide it. Does anyone know exactly what you call that type of driveway surface? I like it a lot. It looks perfect for this house. I remember this place from 30 years ago..it looks exactly the same, as does much around it (from what I can tell here from bing ). Kinda clumsy on the outside, kinda perfect on the inside, and a site to kill for. Hmmm. What could go wrong? You've forgotten the good-natured whore in the second volume of Lord of the Rings. Currently owned by the Goldman family who, at one time, one of the biggest landlords in NYC. Thank you for this blog - it's wonderful. love it....my mom grew up here - the daughter of the cook and butler! Lived there in the '40's in the servants quarters as my mom was the cook and dad the butler. Convesely I was the princess living in that stunning estate that was as grande as Mrs.Wilson herself. It should be maintained in the style in which it was conceived.